pertaining to investing in Dollar Cost Averaging. Last week, we received an email from a reader asking about his regular investment plan, or as some people know it, Dollar Cost Averaging. "When the share price goes lower, or even in downward trend, shouldn’t he be selling the shares and prevent further losses?" But before we answer his questions, allow us first to share 2 key points with you. Point #1. Short Term or Long Term? In the financial world, there is a continuous debate whether people should invest in short term or long term. And sometimes, the former would seem favored because it seems to have a more ring to it and less commitment, meaning one can depart before something bad happens. But in terms of the market, we believe that on the contrary—and not meaning to impose—a stock market in the short run is very unpredictable. However, in the long run, it is a lot more predictable. Think of it this way, there is more volatility in any given day than it has when you think yearly. So ultimately, we would rather play the long-term game. Point #2. Falling Stock Prices: Is it bad or good? Unlike the popular belief that falling stock prices is always bad, believe it or not, it can actually be advantageous as well. The reason for this is that it allows you to buy more shares at lower cost and profit from it when the market goes up. In fact, we wrote an article where we experimented investing $500 every month into STI ETF. And we started this experiment at the worst possible time, which was during the 2008 financial crisis. "And the result was an annualized 5.8% Return to date—from $60,000 worth of capital to $81,000. " This goes to show that when Dollar Cost Averaging, even if the share prices go down, you can still make a profitable return in the long run. However of course, we can’t ignore the fact how this strategy is often less taken up since it is not for the faint hearted. It takes a lot of courage when your are riding through market crashes. But if you are extremely risk-averse, there is no need to worry. You should consider investment options such as the Singapore Savings Bond, Fixed Deposits, or even some Endowment Plans where the principals are guaranteed. 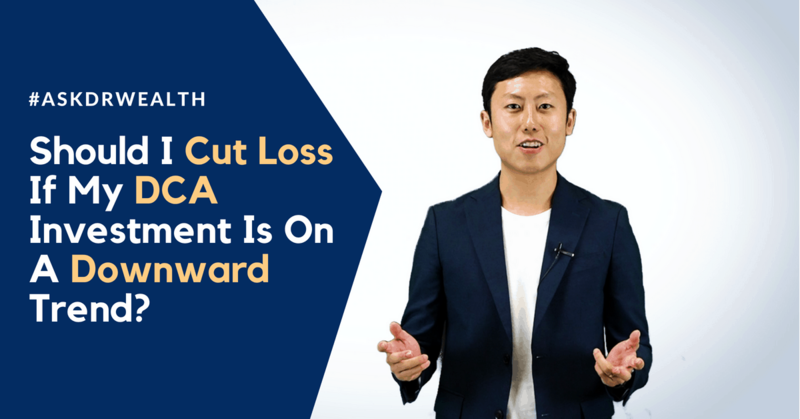 Now, let me know what you think below: should he cut loss on his Dollar Cost Averaging strategy even when his shares are on the downtrend? That’s it for today at #AskDrWealth. See you next time for more answers! We Experimented Investing $500/Mo In STI ETF During 08 Financial Crisis. Here's The Results. that depends if he is invested into ETFs or share counters. if it’s the former – i will stay invested. if it’s the later – i will re-evaluate the company’s overall fundamental and assess if it’s good to stay invested.